You can choose from some of the best cruise deal offers on the market this weekend, thanks to our deal hunters. 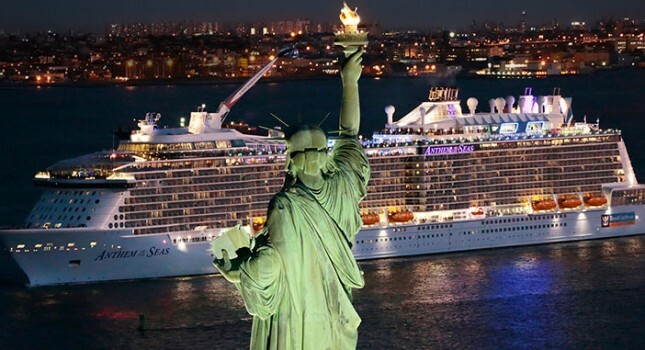 For instance, you can be among the first to sail on Anthem of the Seas, the newest cruise ship in the fleet of Royal Caribbean, on a great 10 nights Caribbean cruise from $1,112 per person. Today’s list also has a week long trip to the Caribbean with Celebrity Cruises from $524 per person, 14 nights luxurious Caribbean islands cruise with Oceania cruises from $7,599 pp, 7 nights Mediterranean cruise to Italy, Spain and France on Princess from $869 pp. Act now, these offers will be gone soon! The Anthem of the Seas will sail on its journey on November 10 with return on November 20 2016. Now, future guests can book cabins on the brand new ship for a discounted price. Interior staterooms start from $1,112 per person while outside rooms are available from $1,295 pp. You can get a cabin with a balcony for $1,409 pp or stay in one of the deluxe suites for $2,523 pp. The guys at Royal Caribbean say Anthem of the Seas is a brand new experience, with skydiving simulator, activities space with circus school, bumper cars and more, a Bionic Bar and so many more features. Other providers from the box might have an even better price for the same Caribbean cruise or a similar one with another line. Compare prices and find the best deals. This entry was posted on Friday, January 22nd, 2016 at 11:28 am and is filed under Cruise Deals, Top Deals. You can follow any responses to this entry through the RSS 2.0 feed. You can leave a response, or trackback from your own site.